Here’s the “Swiss Army Knife” of small amplifiers. The RevNet™ 2140 and RevNet™ 2140-D give you the power, versatility and quality you need for both commercial and high-end residential installations. 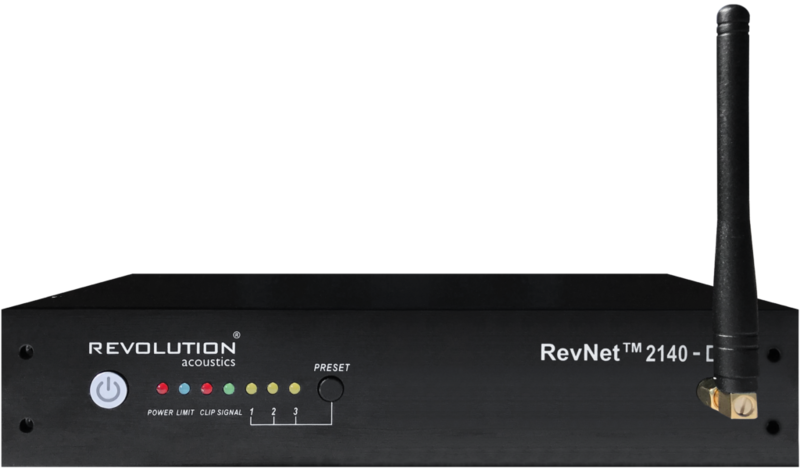 One RevNet amp will power two speakers. Units may be daisy-chained for larger applications, and the RevNet 2140-D has the added power of full Dante® compatibility with AES67 support. Loads of headroom with 26 dB gain, coupled with the lowest distortion you’ll find on any comparable pro audio amp. Audiophile-quality RevNet amps are suitable for both pro audio and high-end HiFi operation. Fast-wiring Phoenix connectors allow you to quickly pre-wire sources and then just plug them into the amp. Direct RVC connections along with USB, TCP/IP, WiFi or Dante make it easy to manage your audio sources and volume. A built-in sound masking generator allows you to quickly configure the amp for corporate uses, while 31 band EQ and RMS compressor bring you complete control over the sound of the room. For more information please call +1-888-699-0671 or contact us.